The Rock N Roll Worship Circus has become The Listening... why? We recently picked the brains of frontman Gabriel Wilson and guitarist Chris Greely about the changing process, the new record, the new songs, and more... Their latest record The Rock N Roll Worship Circus Becomes The Listening is available now! 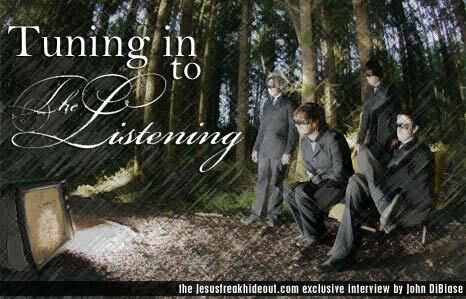 This interview took place on: 10/20/05. Jesus freak Hideout (John DiBiase): What lead to you changing the name and what lead to you choosing The Listening? Gabe Wilson: "Untitled." And then we were working on "I Love The Rain" and "Like I Do" and all the songs that would become the EP, and we're about a week out from when we had to leave for the Delirious tour and we're like, "Gosh, we need to practice some of the old songs." And so we play the old songs and we play the new songs and there was such a line of demarcation and lyrical focus and musical everything. At that point we actually said, "We should probably change the name of the band, but everyone knows us as the Worship Circus, let's just be really really slow about it and just walk wisely. And so we put out The Listening EP. We made "The Listening" really big and "presented by the Rock and Roll Worship Circus" really small. And at some point, we were wondering when and if we were gonna do a name change and how we would do it, and then we went overseas and toured with Delirious throughout the UK and played in Europe more. We came back home in the fall and the writing style just more of the same. It was like an extension of the EP. All of the songs for the most part, were written from Christ's perspective or God's perspective and it just made sense. It was time to make the Rock and Roll Worship Circus become The Listening. So we thought the easiest way for the name change was just to call the record, The Rock and Roll Worship Circus Becomes The Listening. And we worked with the guys at Furious on some strategies on how to kind of convey that through packaging and different things like that. It was a long process really. It's been a year and a half. The process has taken a year and a half, but it's been well worth the wait. JFH: Why The Listening as the name? Gabe Wilson: Well for that very reason. We've kind of assumed a prophetic role in the songwriting. Not prophetic as in 'telling the future,' but prophetic representing the words of the Lord - being a prophetic voice. So the a lot of the songs are even written from the prophets like Isaiah and Hosea and different books of the Bible in Jeremiah and Lamentations, rather than the older songs where the things that used to inspire lyrics for the older songs were like Psalms and different things like that. So it just made sense that these songs were about listening to the voice of the Lord rather than the Rock and Roll Worship Circus, which was kind of about this... Rock and Roll Worship Circus was awesome, in the sense that what it was about was creating this community of oneness and this experience of fellowship around worshipping God together. What we were noticing was, especially when we went over to the UK, we would just play our songs and crowds were like completely cathartic and motionless and not moving. Sometimes not clapping and just very still, but very intent on listening to what was going on. It was like the name we had chosen for the EP, that would be the name for the band was literally kind of taking shape. In the same way, the Circus did. The Circus got kind of crazy sometimes - throwing toilet paper around on "The Party Song." I remember that happened at one church. The pastor went in the back and grabbed rolls of toilet paper and started TP-ing his own church. It was crazy! *laughter* He said he would get kicked out of the denomination if his cleaner should have seen it. The Listening is very much about the Circus, like it has become a theater, so to speak, and now everyone's just wrapped up in this experience and it's still even happening in the states and not just been something that's in Europe. I'm giving you a lot to work with here, but it's not just happening in Europe, it's happening here, hopefully even tonight. JFH: What do you hope to do with The Listening that you couldn't do with the Rock and Roll Worship Circus? Gabe Wilson: I really hope, and we're really praying that, The Listening will become known as a band that will bridge the gaps that are between Christians and non-Christians. Basically we hope to play in more neutral venues where unsaved people that don't know Christ will feel comfortable coming. I think the Circus was very much for the body of Christ, and that's awesome. Like I said, the Circus was rad, but the season that God's called us to now, in fact, He even gave us a specific word during a Bible study that we would be known as a band that literally restores the breach between the church and the unchurched and that's what we hope to do. JFH: There's a noticeably darker tone to your new record. What were your musical and lyrical unfluences on The Listening? Chris Greely: Pink Floyd. Always. *laughter* Anything that's not happy and bright. It's just all dark. Gabe Wilson: It just kind of ended up that way. We didn't set out to make a dark record. Chris Greely: We just enjoy those kind of chord progressions a lot more than the other kinds. So it seems we write what we would like to listen to. I wouldn't wanna listen to anything really happy and jumpy or skippy. Gabe Wilson: But even "Like I Do" and "The Way That Love is Made" is a lot brighter. The EP is really bright compared to "Be In Your Eyes" or "Hosea in C Minor" or something. Chris Greely: We just like to write what we would like to listen to. Gabe Wilson: And the things that were going on in other people's lives or in the lives of people around us definitely have always inspired us. I remember writing "Untitled" about a really close friend of ours. A really close friend of ours who had just gone through this severe battle with drugs and alcohol. "Untitled" was a song written from God's perspective to them. Basically God just looking at him and inviting him to come and be hidden in His side, in the Savior's side. And so you have all of these things happening around us, and in our church, and just the community of friends that we have around us, and those are the things that inspire the tones and the lyrics and things like that. What would the Lord say in this situation? What would the Lord say, of course, then you're blending that with Scripture or praying for lyrics and you're looking at Scriptures. One thing that was really amazing about this record is this is the first record that Solo (Chris) and I haven't produced together. It was actually a team effort, so this one was produced by the whole band and everybody was pretty much in each other's stuff and in each part and we wouldn't actually lay anything down and keep anything unless everybody was happy with that person's part. It was pretty cool because it allowed for me, instead of sitting in the producers seat, to take like 25% of the production and just basically sit with just the laptop and Bible and notebooks from all of the years and just looking at old words and poetry and lyrics and trying to come up with the best words that we could have and then running them by the guys. And all the guys are in with their words and 'what if we tweak this' and 'what are you trying to say?' I remember the first version of "The Factory" was really bad, and it was really dark and Eric's just like, "Forget it. We can't write about that. What's the meaning?" I described the meaning to it and he's like, "Yeah, but that doesn't sound like that's what you're saying." "The Factory" is a song about someone who gives their life for the Gospel and they die by the hands of crooked police, basically. But it's all in metaphors, it's like a parable. So the first version, there wasn't even anything closely resembling that, it was my first draft and he just sat down with me and helped me tweak it. Then we're running it by Chris and Josiah and it was cool. It was really neat the way it worked. JFH: That's cool. "The Factory" was one of my questions. Gabe Wilson: Of what it was about? Actually interestingly enough, this isn't to make you feel weird, but the only people that haven't been able to figure out that song have been Christians, which is strange. We went on tour with this kid named Pat who was a really good friend of Trevor our sound guy. He heard it that night at one of the shows. Chris Greely: He's not a Christian. Gabe Wilson: Yeah, he's not a Christian. Sorry did I say he was? Chris Greely: No you didn't. Gabe Wilson: Yeah, Pat's not a Christian and he looks at Trevor and goes, "Is this a metaphor for evangelism?" And Trevor goes, "Yeah it is." And Pat goes, "Oh." *laughter* It's happened a couple other times, too. Yeah, they just totally nail it deadpan. It's just funny how that works. JFH: I was listening to it and wondering about it. But every time I listen to it I pick up more. Gabe Wilson: Well it starts at the middle of the story. "The Factory" starts in the middle of where he's come upon the factory and he's broken in and he's detected by the police who are crooked. They're like the governing authorities in the land that are trying to kick prayer out of the schools, you know what I mean, basically the crooked - the people that want crookedness and disorder to be our law system. And basically, he goes and he has these pages of the Bible that he's had to rip out and smuggle in a bag with gasoline and matches, and he's lighting the pages of the Bible on fire which is just a metaphor, not for burning the Bible, but for literally using the Word of God to set the factory on fire - the world on fire. But they shot him twice. The first bullet strikes him, and the second one hits him but he was able to get the match lit and it goes. And the second verse actually starts where he's commissioned by his priest to go out as a missionary and he's freaked out because he knows what he's up against and just kind of goes through all of his thoughts and then it goes back and it catches up to where the last section of the second verse is actually the first verse and catches up to the middle of the story. Kind of a Tarantino, start in the middle thing. JFH: That's awesome. One of the distinct qualities of the Worship Circus was that it was very alive and there was a lot of joy in it. And I noticed there's a lot of joy missing from the new stuff. Was that deliberate? Gabe Wilson: No. I don't think so. I don't think it was deliberate at all. But there is a broken quality to this record that is a lot different than anything that the Circus did before. The Circus was very optimistic. The Listening has sort of become an antithesis of that focus, but it's actually just the voice of God to a broken world, which is why I think that The Listening has the ability to just go outside of churches a lot more than the Worship Circus did. The Listening has a voice from God that is for the things that are very universal. The truth is we're all gonna go through stuff that's really really hard in our lives despite the fact that we follow Christ, and if we don't know Christ then it's really sad because we go through life without the strength of God upholding us. So it's just God's voice speaking to broken hearts and the universal nature of His love and that stuff. JFH: What is "Lovely Red Lights" about? Gabe Wilson: "Lovely Red Lights" is actually about Amsterdam. We were in Holland staying at the YWAM base which is right in the middle of the red light district actually. So it's not uncommon to see the shops where they sell drugs and shops where they sell women. So we just wrote about it. The last verse has more of a redemptive quality, talking about the Spirit of God moving kind of across the water, but it says canals because that's what they have there in Amsterdam is canals going through all the streets. And It moves across the waters through the canals down to the Paradiso, which a club where we watched the Dandy Warhols and He goes right through the Red Light District and is able just by the hand of the Spirit to turn one red light white. It's basically a prayer. It used to have a chorus that said, "Pray for Amsterdam" but it's so cheesy and we couldn't bring ourselves to keep it. It was just bad. *laughter* Every time we would go by it, we'd laugh at it. It's a song basically about... Psalms tells us that, "If I descend into the depths of hell you'll find me and if I climb above the stars You're there. I can't hide from Your presence." I just believe that the Lord has the ability to have His presence anywhere, even in dark and seedy Amsterdam and that's what "Lovely Red Lights" is about. JFH: How about "When the Idol Dies?" Gabe Wilson: "When The Idol Dies" kind of switches back and forth from modern to ancient in its time frame because you'll notice there's references to cell phones. But the basic premise of "When The Idol Dies" is the disciples having an expectation of what the Messiah would look like. Even all of us in the church today, have kind of a version of Christ that we project onto Christ. And a lot of times there's things that happen in our life where that image of Christ literally gets crushed and we find out it was actually just an idol that we created about His character or something. And that happened to the disciples when He died, their idol died basically and what they were left with was the Messiah, but they didn't know it at first. And the chorus kind of speaks from Christ's perspective where He's talking to them, basically prophesying His death, saying they're gonna take everything, they're gonna break Me, but if I have you that's everything to Me because that's why He's giving His life, to lay His life down for all of us. JFH: What's your favorite song off the record and why? Gabe Wilson: "C Minor" for me. "Hosea in C Minor" is mine. For you? Chris Greely: Probably "The Factory." Gabe Wilson: "The Factory?" Yeah, both are equally great. Chris Greely: The Factory because of the cool drum sound I discovered on the kit. Gabe Wilson: Yeah, you did that on a great drum sound too, that was awesome. I love "Hosea in C Minor" just because of the thing that happens when we play it. It kind of reminds me of "The Undiscovered" and some people have said that it's like the new "Undiscovered." "The Undiscovered" is still overwhelmingly powerful and this one kind of sneaks up on you in a really peaceful sorrowful way and we hit that big musical bridge live and it's really beautiful what happens. People are just generally really intent on listening to what happens and what the song is saying. Chris Greely: There's our five minute radio hit right there. Gabe Wilson: Yeah our eight minute radio hit. With our long two minute one chord intro that goes forever. But I remember when we first played it in Germany we had just written it in November of 2004 when we flew to Germany for Christmas Rock Night and we played it for an encore and Clint our sound guy at the time comes back and he's got tears all in his eyes and everything and says, "I'll sell everything and give it to you." And I'm like, "What?" And he's, "I'm serious I'll give you everything that I own because that is the greatest song that I've ever heard in my life." And he's just bawling and what it spoke to him, which was weird, and it has no connotation to this whatsoever, is a broken relationship between father and son. And what's odd is we played it one time at this church in the bay area and there was a couple of people that had hidden themselves behind doors and other people were crawling underneath pews in the church crying. Just hiding and trying to isolate themselves from people because they were having such a moment and they didn't want to be disturbed. And the pastor, whose name is Todd, was like, "It was the weirdest thing, I've never seen anything like it. People hide behind doors so they can cry or crawl underneath the pews instead of just kneeling down." Just because there was this really cool broken and healing power to it and a lady wrote us a note the same night and just said that the song broke her heart in the sense of all the times that she's literally walked away from Christ even though she walks with Him and the Lord was just talking to her about drawing closer to Him. Just weird the stuff that was going on that night. So that's why I love it. I love the ministry part of it. And I love the drum sound. I freaking love the drum sound. *laughter* Not just because Chris is here. It's one of my favorite drum sounds. JFH: What's God been teaching you lately? Gabe Wilson: That I'm really prideful. *laughs* Yeah, man I'm really stuck on myself sometimes. That's honest. Honestly, honestly. That's it really. If I have one vice it's pride and just trying... catching on to a lot of the lofty statements I make about how great I think I am or we are. There's sometimes where I'm confident and there's other times that I'm prideful and just not toeing that line too much, but trying to walk with a man's heart of humility. It's tough. How bout you? Chris Greely: Not to judge people I suppose. Not anybody for anything ever. Really. I mean when you don't know. Judging. Of course that's judging when you have no clue what's actually happening. Unless you're there you don't know. Gabe Wilson: There it is. Chris Greely: I'm like Anakin Skywalker? Gabe Wilson: Remember we were joking around about Star Wars and we're like, "He's like Anakin." I don't know. Whatever. Chris Greely: It's messed up man. Gabe Wilson: Only Episode One was out then or Two had just come out. You had fallen in love with Nicole and he had fallen in love with Padme. *laughter* (John: There's another quote from you and it's the one when you were talking about how, in Empire Strikes Back when Yoda admonishes Luke, and you're like, "I'm the worst Jedi ever.") I am the worst Jedi ever.